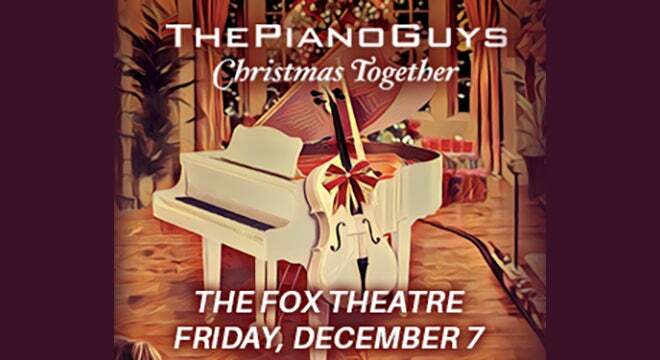 The Piano Guys, who created an Internet phenomenon with their original blend of classical music with pop will return to showcase their talents live for a concert at the Fox Theatre on Friday, December 7 at 7:30 p.m. as part of their “Christmas Together” tour. The Piano Guys consist of Jon Schmidt on piano, and one other instrumentalist, Steven Sharp Nelson, on cello. Yet the other two, producer/videographer Paul Anderson, and music producer/songwriter Al van der Beek, are equally significant members of the group. The spectacular videos, which have so far netted over 1.2 billion YouTube views (their YouTube channel also has over 5.4 million subscribers), are essentially divined by Anderson. "Jon had built up a fan base for 20 years, and we used that as a springboard for getting exposure," Anderson notes, "but it's all about the merits of the videos, and share-ability. People see them and then share them with their friends on Facebook, and before you know it, they can take off."